When you open a bottle of wine from an historic estate you are uncorking its history, vicissitudes and ambitions: all of which will play a role in its taste. Decisions made even one hundred years ago (for example, to acquire a plot of land) will have an impact on the wine today. A will, inheritance, marriage, death, but probably not a dalliance, will all leave their traces in the glass. The vintage 2008 is a snapshot in a family album whose volumes are already numerous. We compare these two wines with reference to their background and aspirations. The two châteaux sit astride the road known touristically as the 'Route des Châteaux' about 7 kilometres south of Pauillac. In road map parlance this is identified more simply as the 'D2' which starts north out of Bordeaux in the suburb of Blanquefort and snakes its way through all the top Medocain appellations following the line of the Gironde as it heads out towards the Atlantic. To the east of the two châteaux is the estate of Château Latour. All the vineyards are situated to the west of the D2. Pichon Baron's main vineyards are all grouped around its château to the north and south. Farther west are those belonging to Pichon Comtesse, interspersed with just a few of its breathren. These are the core vineyards which are primarily used to make the blend for the grand vin (the first wine). Pichon Comtesse also has a parcel within the appellation of St Julien, above those of Léoville las Cases, which due to the rules of the Appellation may not be included in any of its wines and are vinified separately. It is probably rather good but since it is not sold commercially it is distributed to the employees of the estate. A process is underway to try to incorporate these into Pauillac much as other estates in St Julien, owners of parcels in Pauillac, have managed to do for their wines. The location of all these plots, the history of their acquisition and bequest, all conspire to explain the different tastes in these two wines. But it's not just about terroir. Unravelling the family lines, marriages, and inheritances of a Bordeaux estate requires a clear head. The modern story begins in 1865 on the death of the last surviving descendant of the original owner. Until 1865 they had both been part of a single larger estate founded by Pierre Rauzan. Although they were ultimately and permanently divided they might easily have been reunited at a certain moment were it not for the chauvinism of a family member – such is life. In the late 17th century Pierre Rauzan, who was the tenant of Château Latour purchased some land near Latour which would become the core of the estate Pichon-Longueville as it became known - these parcels are called the Enclos Rauzan. When Rauzan died in 1692 he left everything to his wife (they had 11 children). In 1694, Rauzan's youngest daughter, Thérèse, married Jacques-François de Pichon (later becoming the first Baron Pichon-Longueville) and they were given the Enclos as a dowry. During much of the 18th century the estate was largely managed by the wives of the heirs to Pichon-Longueville, their husbands either absent, or dead. Their work ensured that the estate was elevated to a troisième cru (later in the 1820s the estate achieved the status of a deuxième cru – a fact reconfirmed by the Classification of Medoc estates in 1855). In 1777, the estate passed to the young Baron Joseph de Pichon-Longueville who was the oldest son of the third Baron. This Joseph, born in 1760, would be in charge until his death some 90 years later – a staggering age to attain in the 19th century. His marriage in 1784 to Marguerite de Narbonne-Peleet d'Anglade brought him a fortune which he used to add further to the estate and he introduced a programme of modernisation. By the time of his death in 1849 he owned more than 50 hectares, mainly acquired piecemeal from the estates of those unlucky enough to be caught at the wrong end of the guillotine during the French Revolution - a fate also suffered by his father-in-law. The French Revolution carved its way through the great Bordeaux estates, and according to its own edicts, any inheritance was to be divided between all the heirs in equal shares irrespective of gender or order of birth. So, five shares were distributed among his four surviving children. Joseph's oldest son Raoul-Albert was favoured in so much as he received his due allocation (10ha) plus that of his deceased brother Louis (who had died in 1835) - twenty hectares in total. His sisters, Sophie, Gabrielle, Virginie, each received their own ten hectares. Sophie and Virginie (she was married in 1818 aged 20 to Charles-Henri, Comte Raymonde de Lalande) threw in their lot together and created a new estate next to their brothers, Sophie's share passing to Virginie on her death in 1858. This is all slightly complicated by the fact that they all continued to make the wine together, selling it under the single name of Pichon-Longueville, something of a necessity as Raoul-Albert had inherited all the wine-making equipment and possessed the only cellar. 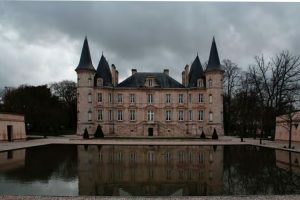 However, at the time of the division of the estate in 1850, Raoul ceded a part of his land to his sisters so they might construct a château and winery. The construction of the château was completed in 1856. It is interesting to note that when the estate was formally classified in 1855 it was as a single domain. When they divided the property they simply assumed that they were each entitled to retain the status afforded them in unity. However, this was not unusual. The domain of Léoville was itself divided into three estates just before the Classification giving rising to no less than three Deuxiemes Crus - Château Léoville Las Cases; Château Léoville Barton; Château Léoville Poyferré. In the context of the period, the Classification of 1855 had only just been published and it had not taken on the force and apparent immutability that it has today. Progressively the 'brand' name of each château would gain in importance and distinction over the years becoming a key element, if not the symbol of its quality and origin. This was directly linked to their management of the vineyard. A rule gradually developed in Bordeaux (in direct opposition to the fluidity of parcel exchange in Burgundy) where either one of the successors inherits the property in its entirety, so that the domain remains indivisible, or it is sold as one entity. This explains some of the changes taking place at the head of the chateaux in the 20th century. So, at the beginning of the 1860s Virginie, also in her 60s, was already in possession of two shares along with the certainty of acquiring that of her last remaining sister who subsequently died in 1875. Not only that, but her brother Raoul, now 71 and in ill-health, was living with her, no longer across the road. Having no issue and therefore no obvious heir one might have thought that he would leave everything to his sister. Doubtless the idea of continuing his family name meant that Raoul preferred to adopt a cousin instead, a young man of 26 years. His uncle made the simple stipulation that his young nephew must marry and provide issue before his uncle's death, conditions which the nephew duly fulfilled shortly before his uncle's expiration who then dutifully bequeathed his title, lands and château to his heir. This marked the end of any opportunity to reunite the estates and thenceforth they remained entirely independent. Whilst the derivation of the name of Château Pichon-Longueville au Baron de Pichon-Longueville might seem obvious enough, the name of the estate Comtesse de Lalande, and indeed the architecture of the château have a more romantic origin. Virginie's husband (Charles-Henri, Comte Raymonde de Lalande) was born in and spent his early years in the Hotel de Lalande, now the Museum of Decorative Arts in Bordeaux, and the design of their château in Pauillac was conceived to remind him of his birthplace. 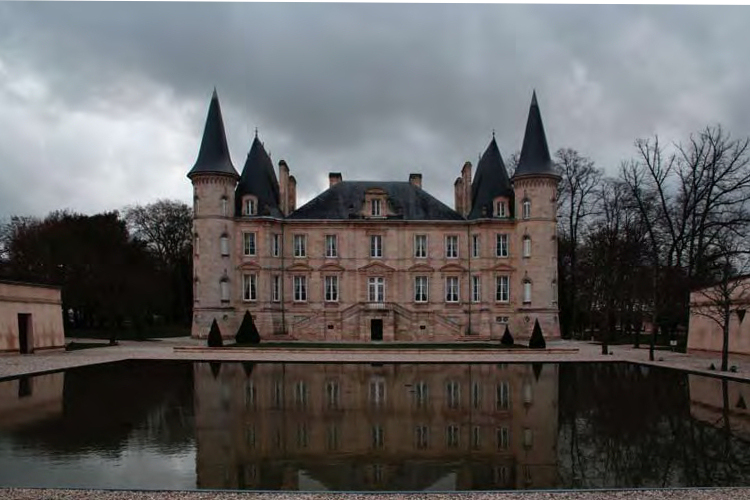 Pichon-Longueville au Baron was acquired by the French insurance group AXA in 1987. In 2006, a majority interest in the Pichon Comtesse was sold to the Rouzaud family, who also owns the Champagne house Louis Roederer. What does all this mean for the differences in these two wines – their taste, quality, future prospects and your interest in them? The original plots which passed down the male line and which are now part of Pichon Baron are, it's probably not being too fanciful to imagine, superior in quality than those that might have been inherited by Joseph Pichon's daughters, albeit there were less of them. The division of the parcels were, after all, controlled by men for the benefit of their sons. They are also closer to the river, immediately adjacent to those of Latour (separated only by the road). New owners bring new inspiration, new talent and a new desire to affect change. The acquisition by Axa in 1987 of Pichon Baron meant a new strategy and ambition for their wines. Since 2000 they have been basing their selection of grapes on the original terroir - the vineyards around the château - which is why they have produced half as much grand vin as they did in the late 1990s. They adjusted their vinification in order to better express the terroir, at least in the years when it shines strongest. Certainly 2008 is a perfect example of this. Insofar as terroir is also capable of human interpretation, there is no attempt to encourage over-ripeness or excessive extraction. There is also a distinction in the quantities of varieties used: Pichon Lalande usually contains more Merlot (it doesn't in 2008) and less Cabernet Sauvignon, which led to the inevitable comparison that Pichon Baron was a more masculine wine and Pichon Lalande more feminine. There is some truth in this. Cabernet Sauvignon automatically makes more massive wines. However, since 2007 Pichon Lalande has also been under new management and the changes are numerous. They too want to make wines with more structure (the gift of Cabernet Sauvignon), whilst retaining the finesse of the historic wines of Pichon Lalande. To achieve this they have planted more Cabernet and their objective is to arrive at around 75% of Cabernet Sauvignon in the vineyard with the obvious corollary for the percentage of Merlot. Their whole system of viticulture has been reviewed and working practices changed. The wines have always been slightly marked by their oakiness and they are reducing the average of new oak in the grand vin to around 50% (currently 60%). So, for them, the 2008 is a classic vintage but also a vintage of transition – borne out by the tasting. In the years ahead it is likely that the two wines will converge to some extent in terms of their construction whilst highlighting more clearly their differences. Château Pichon-Longueville au Baron de Pichon-Longueville 2008 cru classé en 1855, Pauillac. Deep rich colour: that of Baron is a noticeably deeper colour. There's a hint of petrol on the nose. The oak is still quite insistent coupled with aromas of rich black currants. The wine has a fat texture with graceful tannins. It is dense, viscous and oily carrying through these textures onto the palate. In the mouth, it is smooth, backed with lots of fruit. There is a lovely balance matched by its soft tannins. This is an elegant wine. Although one might think of Pichon Baron as being masculine – it is meatier, more structured, stronger even than Pichon Lalande it is also voluptuous, and energetic. 71% Cabernet Sauvignon, 29% Merlot. Oak: 80% new barrels / 20% one-year old barrels. Château Pichon Longueville Comtesse de Lalande 2008 Grand cru classé. Present tannins but also lots of rich fruit. Plenty of of oak at this stage on the nose too. Mellow and persistent with long tannins. It's still a little austere but has a light touch and is eminently drinkable. The Château started to use techniques which brought much more fruit (apparent in 2009 and 2010) and this will now continue because it takes a few years for viticulture practices to take effect. There is much less Cabernet Sauvignon than Pichon Baron and this has a big impact on the taste of the wine. Although Pichon Lalande has some Cabernet Franc and Petit Verdot these are present more for the purpose of making up the assemblage and don't give typicity to the wine. 63% Cabernet Sauvignon, 29% Merlot, 3% Cabernet Franc, 5% Petit Verdot. Oak: 60% new barrels. The two châteaux sit astride the road known touristically as the 'Route des Châteaux' about 7 kilometres south of Pauillac. In road map parlance this is identified more simply as the 'D2' which starts north out of Bordeaux in the suburb of Blanquefort and snakes its way through all the top Medocain appellations following the line of the Gironde as it heads out towards the Atlantic. To the east of the two château is the estate of Château Latour. .../continued... you need to upgrade your subscription if you wish to read this content. .../continued... you need to subscribe to be able to view content from Fine Wine magazine.